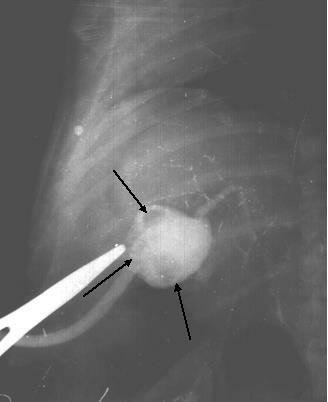 Orthotantalates of lanthanum (LOT), yttrium (YOT) as X-ray agents exhibit uniform distribution of insoluble particles, high effectiveness of absorption in the low dose given to a patient, and high degree of contrasting, the combination of high adhesion to mucosa tissue of organs and good fluidity in applying the external stress that results to increasing reliability of results in carrying out the diagnosis. In the work Zuev M.G. and Larionov L.P. "Tantalic Radio-Opaque Drugs. Preclinical Studies" Monography. Lambert Academic Publishing, 2012 [in Russian] shown, that Orthotantalates of lanthanum (LOT), yttrium (YOT) as X-ray agents exhibit uniform distribution of insoluble particles, high effectiveness of absorption in the low dose given to a patient, and high degree of contrasting, the combination of high adhesion to mucosa tissue of organs and good fluidity in applying the external stress that results to increasing reliability of results in carrying out the diagnosis. Invention can be used as X-ray contrast agent in X-ray assay of different organs. In the work Mikhail G. Zuev, Leonid P. Larionov and Iliya M. Strekalov New Radiopaque Contrast Agents based on RE Tantalates and Their Solid Solutions. SOP TRANSACTIONS ON PHYSICAL CHEMISTRY ISSN(Print): 2372-6156; SSN(Online): 2372-6164 Vol. 1, No 2, June 2014 noted: ?Tantalates of the composition MTaO4 (M = Y, La, Ln) have different K-absorption jumps. Therefore, using the substances that contain these chemical elements, it is possible to vary the radiation absorption and to change smoothly the image contrast. These RCA can be used for contrast studies of hollow organs and for X-ray surgery of gastrointestinal tract and bile passage organs. It was shown experimentally that the peak on the diagnostic spectrum of X-radiation is at 72 ± 6 keV . So, it can be concluded that the image contrast will be higher with Ta-containing preparations than with those containing iodine (the K-jump of tantalum is at 67.403, while that of iodine is at 33 keV). In the chemical composition of RE tantalates there are two chemical elements: tantalum and lanthanides having the K-absorption jumps in the range from 17.038 to 63.31 keV. That is why these compounds provide radiation absorption practically over the whole range of applied quantum energies. This was experimentally confirmed for LaTaO4. Thus, when place LOT in the gel form was used as a RCA for X-ray studies of the bile passages, this method exhibited a high resolving power in the examination of the hepatic tree and the gallbladder and in the diagnostics of intracavitory masses in ducts and the gallbladder. Unlike iodine-containing urografin, the gel suspension of placeLOT exerts no negative effect on the mucous tunic of bile passages of laboratory animals. Author: Dr. I. M. Strekalov, Central City Clinical Hospital No. 1, Ekaterinburg, Russia. Prof. М. G. Zuev, Chief Researcher of Oxide systems Laboratory, Institute of Solid State Chemistry, Ural Branch of Russian Academy of Sciences, Ekaterinburg, Russia. Dr. L. P. Larionov, Professor of Department of Pharmacology and Clinical Pharmacology, Faculty of Pharmacy, Ural State Medical University, Ekaterinburg, Russia.